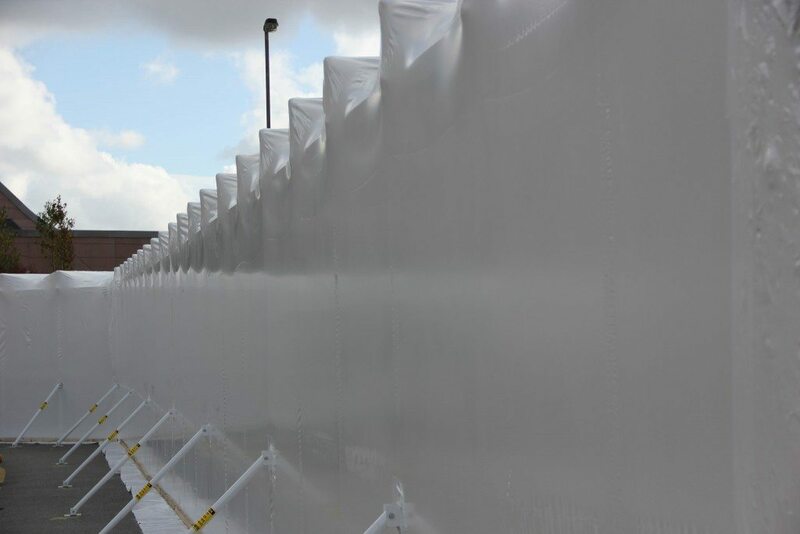 We first experienced the Safe Route System after providing temporary weather protection to Safe Route walkways, including installations at Alder Hey hospital, Liverpool and One Blackfriars, London. We were impressed with the appearance, versatility and sustainability of the system which created zero waste unlike traditional solutions such as scaffolded covered walkways and timber hoardings. Over time, the Rhino installation teams have become skilled in the erection of Safe Route walkways, hoardings and rooms. 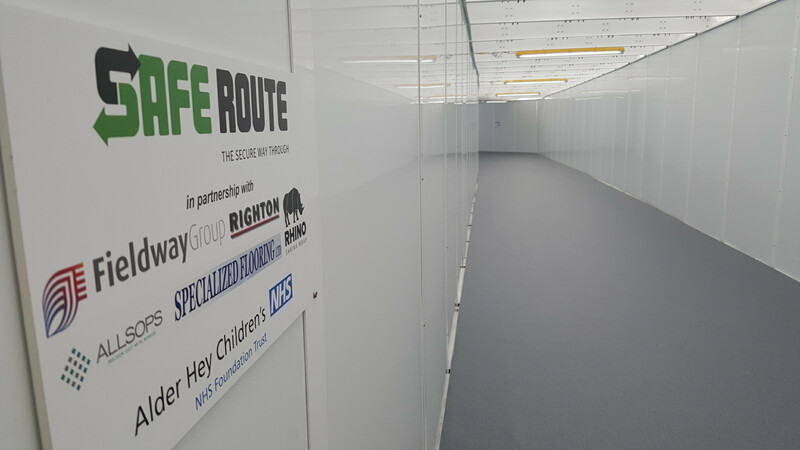 We are supported by Safe Route’s in depth technical knowledge and experience acquired over 9 years and from clients including Network Rail, London Underground, The NHS and Sainsbury’s. Safe Route is a modular system which is designed to allow construction programmes meet and exceed their Health and Safety responsibilities. It protects operatives and the public from falling material and other common construction hazards, segregates work areas from the public, and provides a safe route through hazardous environments. Within the frame are inserted interchangeable & ‘brandable’ panels. The panels may be composite aluminium or fire rated (BS 476 Part 22) composite fibre reinforced cement boards (60, 120 or 240 minutes). In addition, fire rated structures are sealed with a specialist mastic to improve integrity and prevent smoke ingress. 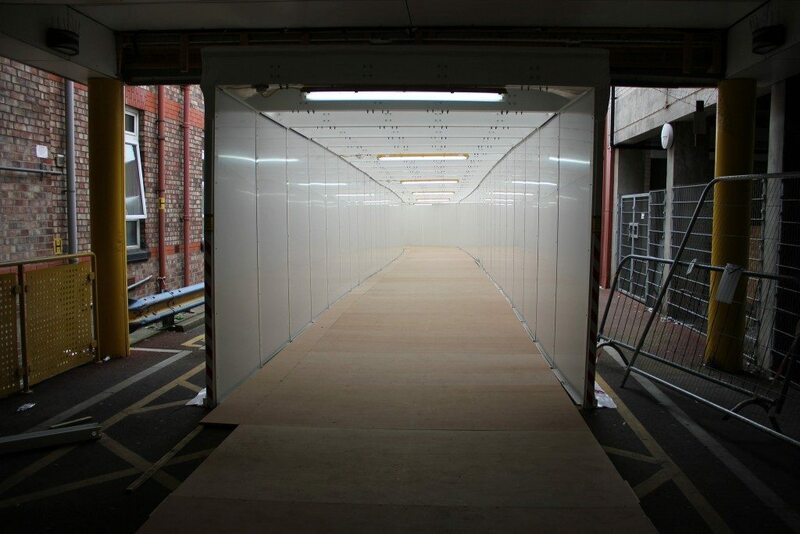 System T – Fire rateable tunnels that allow pedestrians to pass safely through construction environments. System H – Fire rateable hoardings / barriers that segregate safe and hazardous areas in construction environments. System R – Fire rateable enclosures / rooms that enable larger temporary spaces to be created. The Safe Route system can be purchased outright or rented. Safe Route tunnels provide complete protection against this eventuality for workers and the public. This is where Safe Route provides its greatest function. It is a shield against falling objects. Safe Route tunnels can be boarded out and fitted with supplied guard rails which conform to these HSG33 guidelines. When used as a working platform, Safe Route tunnels are fitted with safety guiderails, reducing the risk of falls. Safe Route products protect construction operation from all of these hazards, reducing their risk of suffering injury. ‘Before work starts, make sure that areas of the site where people may be struck by falling materials have been barriered off’. (HSG150, Health and Safety in Construction, Paragraph 172) Safe Route tunnels and hoardings are barriers to falling or otherwise projected materials. For a discussion of your requirements, contact us and we’ll help you identify which Safe Route products are right for you. Can a Safe Route system be fire rated?